Just a quick update to say that I am managing to open the toolset a little more this week than I have for the last few weeks. The issues I mentioned in the last post still remain, but in a lesser capacity. Even Daisy is becoming more accommodating when it comes to taking her medicine. I had the opportunity to take a closer look at some of Kamal's area work, which was encouraging. He has been hard at work coming up with some more great interior designs, which he kindly said I could adapt to use. As there are one or two interior areas that still need doing, this has saved me some time and meant I could look at some other parts of the module that needed doing ... including adding background to potential party members. My goal has always been to allow six main characters within the party. (Henchmen, animal companions and summoned creatures can be added to this number.) The six main characters are made from players, created PCs or companions. However, I also wanted to design a system that had created PCs or companions both react in a similar way with respect to any dialogue they may be offered throughout play. 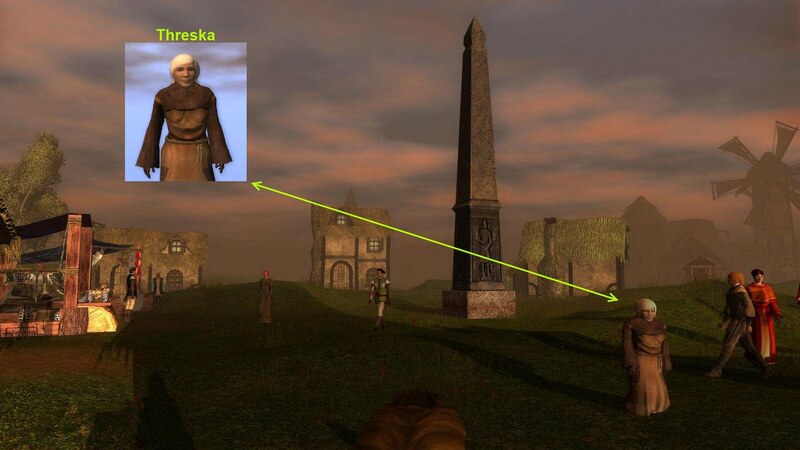 This involved writing a script or two to help determine which type of character was being played (created PC or added companion) and used in such a way that the commentary appeared normal and seamless irrespective of what type of character a player was using. This meant that while there is more flexibility for the player regarding what type of PC they chose to play with, I have to take care when writing specific dialogue for companions in particular. Last week I took my first steps at writing some character background for a companion that the players can find, called Threska. Is Threska Somebody You Can Work With? Threska is not the first companion I have written some background for, but is, hopefully, a sign that some of the final conversation scripts needed are coming together at last. (I needed quite a bit of the module to be written before I can start to add companion/PC commentary.) I am trying to include some interesting background for every companion that might encourage players to consider using them alongside (or instead of) any created PCs they might be using. I have also designed an influence system that monitors the player's actions against the created PC/companion's own alignment and beliefs. A clever player will be able to work around potential party conflicts, but in the end, what the player does can and will affect their relationship with other members of the party. So, if a player does not lead as they give the impression they will, then they can expect some rebuking from other party members and eventually abandonment if the player still ignores their party members' pleas.